A detail of the iconic tower as seen from below. 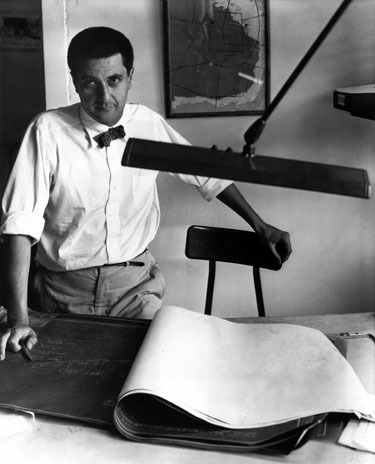 Bertrand Goldberg as a young architect in 1952. 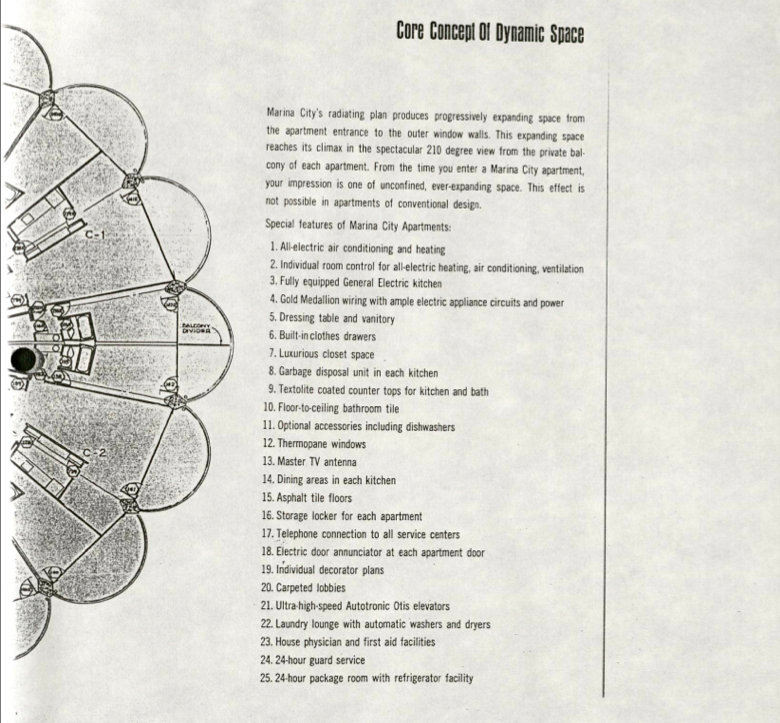 An early brochure of Marina City's conceptual elements. The foundation of Marina City in 1961. One of the project's best-known and most-loved characteristics are the porches. Here, a swinging porch soiree from 1976. It took a few decades before Marina City had neighboring buildings. Here a view of modern day Marina City in context. If you’ve made your way around downtown Chicago, it’s likely you’ve spied a set of towers that look like nothing else around: Marina City. 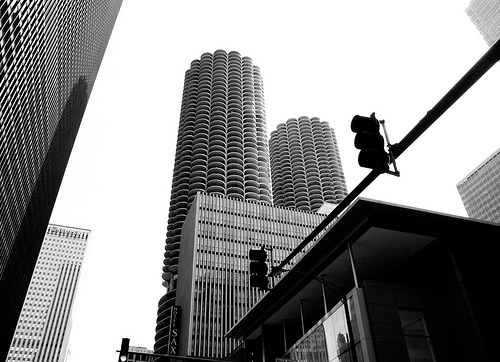 The set of ruffled high rises is also referred to as “the corncobs” or “the Wilco towers” because they figure prominently on the cover of the well-known band’s Yankee Hotel Foxtrot album. Does present-day Marina City align with the designers’ intentions? 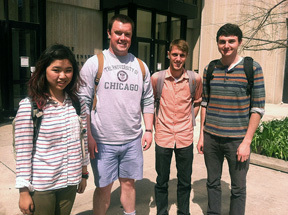 Colin was part of a University of Chicago class called “Buildings as Evidence,” which looked into architecture, its environment and implications. And as part of a special collaboration, Colin got to answer his own question — along with us (his classmates) and a little help from Curious City Senior Producer Jennifer Brandel. Collectively we tackled Colin’s question by scouring historical archives, the Internet and the towers themselves. (For that play-by-play, check out our reporters’ notebook). Despite its futuristic design and the best intentions of its designers and financiers, the Marina City of today occupies a very different position in its environment than it did when the first tower was completed in 1962. Built as a directed project with a specific goal in mind (namely, stemming urban flight), the evolution of Marina City in Chicago’s skyline begs a pointed question: Did it work? Chicago-born architect Bertrand Goldberg saw structures as having power far beyond his novel designs. He believed architecture could influence behavior, improve our quality of life and even enhance democracy; that is, if only we would create structures that naturally foster a sense of community. The intention of the first plan was to remove people from the city without actually placing them outside the borders. This was to be accomplished through verticality, by building residential life up rather than out. Essential to this was a “plan for relaxation and pleasure.” Goldberg wanted the towers to offer enough leisure to create a “two-shift city” so the downtown would retain vitality once the working day was over. The book The Apartment House in Urban America by John Hancock (not to be confused with this John Hancock), offers early descriptions of Marina City’s early innards. The first two floors contain the “building machinery, shops, restaurants, bars, offices, a TV studio, a skating rink, a plaza and a sculpture garden next to a 700 boat marina.” The 18 floors atop the first two commercial stories contain a “helical ramp parking garage for 900 cars for the 896 apartments.” The residential space begins on the 21st floor, “high enough for unobstructed views and just above the greatest concentration of downtown air pollution.” The amenities combined with the buildings’ structural ingenuity created a new living dynamic. Looking through the Goldberg Archives at the Ryerson and Burnham Library of the Art Institute, we discovered publicity materials for Marina City dating from the early 1960s. One of the main selling points was the buildings’ height. The twin sixty-story multi-use towers were billed as the tallest concrete buildings in the world and as the first all-electric city. Comparisons of Marina City to nature (first used by architect Bertrand Goldberg) were common in newspaper articles. An article written by Ruth Moore of the Sun Times describes apartments that “open out from the buildings’ cores like the petals on a flower.” Chicago Tribune journalist Thomas Buck wrote the two towers were “two trees, each 585 feet high, with 900 ‘tree houses’ featuring special psychological benefits for tenants.” The official brochure, titled “City Within a City,” emphasized the fireproof core structure, the view, the leisure complexes, living above the noise of the city and the fact that all-electric appliances and utilities allowed residents total control over the temperature. The marketing campaign enticed 2,500 rental applicants for a total of 896 available units, requiring a screening committee to pick residents. A diverse set of folks moved in; the list of residents for November 1964 contains mostly German, Scandinavian, British, and Jewish surnames, with a total of six African-Americans living in the buildings. Many of the residents were from Chicago, the Chicago suburbs, and New York City. Some were wealthy, leaving contact addresses in exclusive residential strips, suburbs and neighborhoods (Lake Shore Drive, Oak Street, Lake Forest, and the Upper East Side). Residents were approximately one-third single women, one-third single men, and one-third married couples. A 1967 article by resident Edward Gilbreth gives a glimpse into life in Marina City. He mentions differences in the prices of apartments — the higher the floor, the more expensive the rent. Gilbreth apparently enjoyed living in Marina City for the location and the conveniences. He eagerly mentions, for example, a cocktail lounge and a “mammoth” drug and liquor store. Before judging Marina City’s mighty charge to create a new way of life while stemming urban flight, its location deserves a look, too. After all, it’s challenging to create buzz for a neighborhood when there aren’t many neighbors. Historic Sanborn Maps (originally used for fire insurance purposes) are full of useful construction details. The maps indicated that in 1951 the riverfront north of the Loop hadn’t yet been platted, and it was home to nothing but industrial railways and cold storage facilities. Aside from the Wrigley Building, there was no large-scale construction. Mid-century photographs of State Street reveal an industrial wasteland, separated from the Loop by a heavily polluted Chicago River flowing freely with garbage. But as construction on Marina City began in November 1960, this scene rapidly transformed. In some sense Marina City was at the forefront of a new wave of development — one that expanded the density of downtown Chicago and spurred new high-rise construction across the river. Plans reveal architect Bertrand Goldberg even imagined a “forest” of Marina Cities populating the riverfront and providing the “city within a city” experience to thousands of Chicagoans. We can only imagine what that would have looked like. While the vision was never realized in practice, the sentiment is visible in the development boom that began in the latter half of the 20th century and continues today. Though Marina City doesn’t dominate the Chicago skyline like it did in 1964, it paved the way for the transition of the north riverfront from an industrial no man’s land to a high-density metropolis. Today, the area is home to some of the world’s most formidable supertall buildings, including the Trump International Hotel and Tower and esteemed architect Ludwig Mies van der Rohe’s 330 North Wabash. In 1977, Marina City Sales, Inc. led a partition of the towers into condos, a physical and ideological shift that didn’t sit well with Goldberg. From the beginning, Goldberg made clear that each structural entity was interdependent. Clearly, he had envisioned a sense of community shared by a group of residents who would be able to live efficiently and economically, freeing them from many financial pressures and thus promoting leisure time and social interaction — all within the confines of Marina City. With these price increases, many residents were forced to leave Marina City, giving way to deep-pocketed real estate investors who purchased large numbers of the repartitioned condominiums. Investors included Charles Swibel and Chicago Alderman Edward ‘Fast Eddie’ Vrdolyak, who was sold “50 condo units … at ‘bargain basement’ prices.” Over the next 12 years, finances collapsed. From the late 1970s through the early 1990s, Marina City changed hands until the non-residential components of Marina City were reapportioned to private business and independent investors through various means, including bankruptcy and loan defaults. What remained was a skeleton of a once healthy and flourishing community. As new business moved into Marina City’s commercial and retail spaces, the city-within-a-city began to look more and more like a central entertainment district that catered to visitors rather than permanent residents. Hotels sprouted nearby and the project’s ice rink was converted to an expensive Smith & Wollensky steakhouse. Goldberg’s city had been spliced up and then infiltrated from all directions. Today it’s unclear how much of a true community remains at Marina City. Steven Dahlman is the resident Marina City historian and a photographer. We owe a great deal of our research to the news, history, real estate listings, and an extensive blog he’s collected on his site: Marina City Online. Dahlman — who lives in one tower and has his photo studio in another — says residents can run into each other in many locations, including the ground-level retail outlets and restaurants, the laundry facilities, the roof-top observatories, and a gym on the 20th floor. Though residents continue to move in and out, Dahlman says a sense of community springs from a low turnover rate. He also says it’s common for one generation of owners to pass units down to the next generation. And while the rent and mortgages at Marina City are not necessarily as expensive as many neighboring River North addresses, Goldberg did not want residents of Marina City to spend large sums of money on anything, including activities and entertainment. Today, the towers are surrounded by dozens of high-end restaurants and clubs where locals and visitors alike can part with their cash. Marina City’s bizarre corncob-esque forms have remained essentially unaltered over the course of their nearly half-century existence, but what of the rest? The buildings have greatly deviated from Bertrand Goldberg’s initial vision. Today they’re more a residential stack sitting atop a mixed-use building than a vertically complete neighborhood. And Marina’s status as a “city within a city” is tenuous at best. But in another way Goldberg’s expectations were met. As noted, the towers now stand amid a cluster of high-density, mixed-use and residential skyscrapers. It would seem that the project did in fact help repopulate Chicago’s urban core. 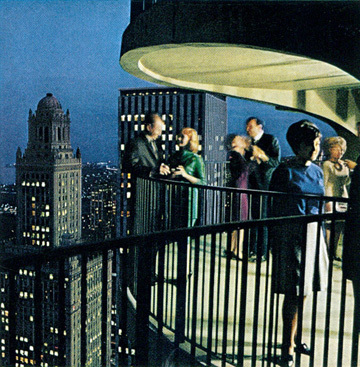 While there’s insufficient data to make a broad claim about the building’s role in post-WWII white flight, some of the aspirations of Marina City’s financiers and designers came to fruition. Though Goldberg’s vision of a concrete forest of self-contained cities in central Chicago was never actualized, his plan for a high-density urban core was not far from the mark. And what’s more, the building’s peculiar, pseudo-organic forms still elicit as much curiosity from tourists and Chicagoans as they did when they were first erected. Still inhabited, still towering above the river, and still downright odd, the Marina City towers are poised to stay. WBEZ’s Curious City is on Twitter! Follow the series @WBEZCuriousCity. Correction: This story originally misnamed an investor. That investor&apos;s correct name is Charles Swibel.